Tyrone Farming Society’s 178th Annual Omagh Show took place in glorious sunshine and Riviera temperatures. The show, which aims to feature all that is good in agriculture and equine, continues to offer an increasingly wide variety of events to suit all interests, under the current chairmanship of Mr Thomas Harkin and vice-chairman, Mr Joe Crozier. The familiar anxiety in recent years around soft going underfoot was replaced this year by the need to spike and water the arenas in the days preceding the show, which resulted in perfect jumping conditions, reported by the competitors. Show activity commenced on Friday with horses and ponies. Four Showing Rings, three Horse and Pony Show Jumping Arenas, and a Working Hunter Arena were very busy for the entire day. Over 200 showing horses and ponies competed in 46 Classes in the all-weather Agricultural grass arena. 82 Working Hunter Horses and Ponies sought a share of the generously sponsored prize fund across 11 classes. A total of 702 Horses and Ponies jumped during the two days. A show jumping prize fund in excess of £25,000 was a huge incentive in addition to gaining points in the leagues and the show is indebted to its many sponsors, whose support is invaluable. Action commenced in the main Show Jumping Arena on Friday with a Four Year Old Performance Class sponsored by Boyd Bedding, with a bridle for the winning combination very kindly sponsored by Mrs E Stafford, Sion Mills. There were 19 starters, ably judged by Mr Andrew Dunlop from Omagh, Mr James Kernan from Crossmaglen Chef d’Equip for the Gain Equine Nutrition Children on Horses team and Mr Eamon Rice from Dungannon, with commentary by International Show Jumping Judge, Mrs Hilary McClelland from Banbridge and Senior National Judge, Course Designer and Show Director, Mr John Chambers BEM from Omagh. Scrutineers were International Judge Eilish Mulholland, Dundalk and Senior National Judge Frances Monteith, Seskinore. Candidate International Course Designer, Raymond Jess, from Co Down, set the course, ably assisted by Candidate International Course Designer Aaron McCusker from Lurgan and Senior National Course Designer Fred Guthrie from Derry. Gabriel Tunney, Tempo, gained the highest score in the Four Year Old Class, and claimed first place, riding his own horse Roses for the Lady. The 1.10m Top Oil Ladies’ League, sponsored by the Killyhevlin Lakeside Hotel and Chalets, was a hotly contested class of 48 starters. For the second successive year, Suzanne Posnett riding her own horse, Karmijn, having left all fence poles in their cups stole the limelight with her speed of 31.27 seconds, followed by Lynne Russell, Strabane, riding James McKean’s Grey Mare, Rockmount Misty Star. Niamh McEvoy, from Augher Point, riding Maeve’s Charlton Chloe took third position. The big event of Friday, the SJI National Grand Prix, had a field of 40 competitors and a prize fund of €4,000 with sponsors the Silverbirch Hotel, Omagh and Powers Irish Whiskey. It attracted competitors from Tipperary, Kilkenny, Kildare, Wicklow Galway, Meath, Louth, Mayo, Cavan, Donegal, Antrim, Derry, Down, Armagh and of course Tyrone. Liam O’Meara from Nenagh, Co Tipperary secured the top position on his own 14 years old Bay Gelding, Mr Coolcaum. After competing at Omagh he travelled to Cork and won the SJI National Grand Prix there on Sunday afternoon with the same horse - quite an achievement in one weekend. Second position at Omagh was taken by John Floody, Dundalk, on Brian Kieran’s Bay Stallion HTS Blackrock. Local rider, Peter Smyth from Victoria Bridge took third place on Kathryn O’Hagan’s Bay Mare, CHS Krooze. Competition in Arena 2 was keen over the two days with Classes from 90 cm to 1.20 m, over suitably challenging tracks which hosted the Ulster Region Summer Tour Qualifiers. The appropriate courses were set by Senior National Course Designer, Ray Buchanan, Scarva, who is also Show Jumping Ireland’s Chairman, ably assisted by Stephen McAlinden, Banbridge and Seamus McCaffrey, Letterkenny. Top places in the 1 30 m Class of 33 competitors in Arena 1 sponsored by Mrs Elaine Waterson & Family, Omagh, were hotly contested and Kenneth Graham from Muff, Co Donegal, riding Harold McGahern’s Beir Bua secured first place and was presented with the Royal Arms Perpetual Challenge Cup by Mrs Elaine Waterson and his share of the £500 prize fund. Arena 3 events on Friday began with a Sportsman’s Class for Ponies over an inviting track set by Regional Course Designer, Seamus McCaffrey, Letterkenny, assisted by Andrew Bogle, Newtownstewart. Saturday’s clash with the RDS Pony Qualifier did not detract from the keen competition over tracks designed by National Course Designer, Alan Lynch from Co Cavan. Activity was keen for the two days with supporting sponsors and it culminated in a Pony Club Jumps Ahead qualifier for Vanne Campbell’s Ruby Anniversary Show to take place at Iveagh Grounds, Moyallon Road, Portadown on Saturday 4 August 2018. Saturday’s New Heights Champions Series GP saw a delighted Kildare based Alexander Butler, riding James Egan’s nine years old brown gelding Eldorado, lead the prize winning lineup, followed by Darragh Ryan from Tipperary’s Ballypatrick Stables riding Alexander Butler’s 11 years old bay mare Rincooa Rua. Third place went to former world champion Dermott Lennon from Banbridge on MJM Pursuit a bay mare owned by MJM Holdings Ltd. The top three winners from both events each received a large collection of gifts from TRM. 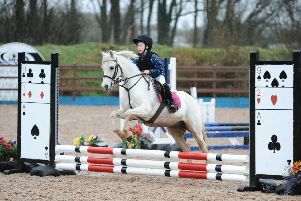 The Ulster Region Summer Tour of Ulster Grand Prix and the 90 cm, 1.00 M, 1.10 M and 1.20 M Classes all had large entries. Muff’s Kenneth Graham, riding Lee Johnston’s Democrat, a grey stallion, led the prize winning lineup on Saturday morning in the 1.35 m Event, sponsored by TC Autos, Omagh. Fellow Donegal man Simon Scott secured second position on his own chestnut mare Jasmine Tide. Third place went to Victoria Bridge’s Peter Smyth riding John Fee’s Des Le Debut, a nine years old grey gelding. Friday Showing Classes in the Cattle Arena saw the introduction of a new set of Junior Showing Classes for Young Handler under ten through to 16 years old. Raymond Bready did a sterling job in keeping all well informed of the order of events. The Working Hunter Arena, with a very attractive sponsored prize fund, was busy throughout Friday having 84 horses and ponies going through their paces, with courses set by National Course Designer Alan Lynch, Cavan. The 1.30 M McGinn One Round Speed event with the Eddie McGinn Memorial Cup always creates excitement with the clock being the decider from the off. Peter Smyth riding Kathleen Gallagher’s grey mare Cruising Lux set the target with a score of 53.51 secs over five seconds ahead of second place winner Simon Scott on a time of 58.58 secs. Third place went to Alexander Butler riding a seven years old chestnut stallion Pico at 65.57 secs. Mullingar, Omagh and Cork are the three Irish venues to host the Royal Dublin Society Puissance Qualifier, which allowed the annual airing for Omagh’s great wall and much excitement at the ringside. Sponsor, TRM’s Managing Director, Raoul Masterson, Newbridge, Co Kildare, was on hand to assess the action, measure the heights and present the wonderful prizes. Seven courageous competitors were game for the challenge and had their sights set on the big wall in the RDS main arena in August. The first round commenced with the wall at 1.60m. Two riders left the competition at that point. Round three with the wall at 1.90 m was the big decider. Galway’s Wesley Ryan, second place winner from last year, took the top position on his own brown stallion Larthago. Second place was shared by Conor Coyle’s gelding Athlet Van’t Lozerhof ridden by Jake Hunter and Leigh Anne Rea’s gelding Cross Guidam, ridden by Valentin Blanchard. Fourth place went to Dominic Webb riding Susan Oakes’ gelding Rockstown Park. Mrs Constance Curran, London, daughter of the late international course designer, Paddy McEvoy, and Mrs McEvoy sponsored the popular 1.10 Ulster Region Summer Tour Class with 70 starters. Once again Peter Smyth led the winning lineup on Kerry McTeggart’s Hennessey VS. Mrs McEvoy and family were on hand to present the North West Show Jumping Club commissioned plaque in memory of the late Paddy McEvoy. Peter Smyth also secured first place in the Donnelly Group sponsored 1.20m Class riding his own bay gelding Shenanigans. Jane Clarke, from Downpatrick, was first in the 1.00m Class and a bridle for the top mare in that class, very kindly presented by Mrs Eve Stafford, Sion Mills, went to second place winner Aoife Carr on Philip G L White’s bay mare, Tyra MB. The highest placed young rider in the SJI National Grand Prix and the 1.35M Ulster Region Summer Tour was Jonathan Smyth from Victoria Bridge and the top young rider in the New Heights Champions Series was Jake Hunter.